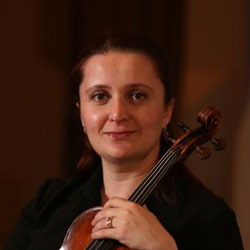 Eka Gogichashvili is Associate Professor of Violin at Baylor University. Where, in addition to teaching a full violin studio, she coaches chamber music and orchestral excerpt classes. Dr. Gogichashvili performs with the Baylor Piano Trio and Eka and Kae Duo. She holds dual Bachelor of Music degrees from Balanchivadze College of Music and from Rowan University in NJ. She also holds dual Master of Music degrees from Tbilisi State Conservatory and the Louisiana State University (LSU). She completed her Doctor of Musical Arts degree at LSU with a minor in orchestral conducting. Throughout her career, Mrs. Gogichashvili has appeared in numerous performances as a soloist, chamber music and orchestra player both in Europe and the United States. Eka’s teaching awards include: Nomination for Outstanding Teaching Award, 2005; Circle of Achievements Teaching Award, 2002. Dr. Gogichashvili regularly appears at national conventions as a performer and as a clinician on various topics of violin performance practice, repertoire, and pedagogy. Her research focuses on composers active during the holocaust, especially the creative output of Erwin Schulhoff. In the summer of 2015 she released a recording of Schulhoff’s violin compositions.